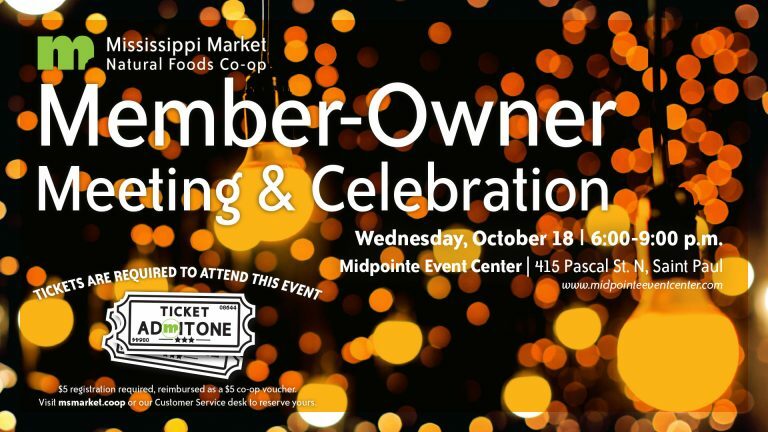 At our 2017 Annual Member-Owner Meeting & Celebration on October 18th at the Midpointe Event Center, we’ll gather together to hear updates from our board of directors and General Manager Gail Graham, welcome newly elected board members, and hear from guest speaker Faye Brown from the Tanka Fund. This is also the last opportunity for member-owners to vote in our board of directors election. We’ll have fabulous prize giveaways, including a free bicycle. Enter the raffle at our Annual Meeting for your chance to win. Register for the 2017 Annual Meeting! Tickets must be reserved by Monday, October 16th. • Your last chance to vote! • Sample treats from local farmers and makers. • Meet Positive Change community partners and donation recipients. • Hear updates from our general manager and board of directors. • Listen to guest speaker Faye Brown from the Tanka Fund. • Learn who has been elected to the board. • Enjoy live jazz music by the Ernest Bisong Group. • Partake in a catered dinner from Common Roots Cafe featuring a sit-down chili dinner with cornbread, salad, and desserts. Gluten-free and vegan options will be available. • Savor cooperatively-produced beverages from Broken Clock Brewing and La Riojana Co-op Wines.